Want to become a CNA in Massachusetts? CNA jobs are projected to grow 11% by 2026. With over 500 nursing facilities and hospitals, Boston offers vast employment opportunities for CNAs. Massachusetts is ranked top 10% for CNA wages, which average at $16/hour, but the top 10% of the nation’s nurse aids earn $50,000. What are the CNA requirements in Massachusetts? Here’s how to prepare for your CNA state exam and how to become a Certified Nurse Assistant. To start a CNA training program, you need to be at least 18 years old. There is no minimum education requirement for nurse aides such as a high school diploma or a GED, however many state programs require a high school diploma or GED to start CNA training. Massachusetts requires all candidates for the CNA training program to pass a criminal background check with the Department of Justice, to check your status fill out the Criminal Offender Record Information Self Audit Request Form and mail it in to the address listed on the form. Next, you will need to find accredited CNA classes in Massachusetts. The Division of Health Care Facility Licensure and Certification oversees the Massachusetts nurse aide training and competency evaluation programs, and also has a list of state-approved CNA training programs. Each program must include a total number of 100 training hours, including 75 classroom hours and 25 hands-on training hours at a nursing facility. The majority of these programs can be found at local community colleges, trade schools, or even the American Red Cross. You can find local CNA classes near you as well as CNA classes online. The program can be completed in 6-15 weeks, although there are some accelerated programs that offer 4-week CNA classes as well. Students are under direct supervision during training and their program instructors must be licensed for nursing in Massachusetts, have a minimum of 1 year of nursing experience, and must have either completed a course on how to teach adults or have verifiable experience teaching adults or supervising nurse aides. Once the training is complete, you are eligible to apply for CNA certification, which allows you to sign up to take the official CNA examination. It’s recommended you take a free CNA practice exam to prepare. You must take the exam at a certified testing center such as the Massachusetts American Red Cross or one of those recommended by the Massachusetts Nurse Aides Competency Evaluation Program. Call the testing office at (781) 979-4010 or (800) 962-4337, to request a testing application and to schedule your CNA state exam. The CNA Training Program can cost anywhere from $400 to $1,200, depending on the program. For example, the American Red Cross program costs $1,300. However, these fees do not include classroom materials, uniforms, or textbooks. Some facilities, such as adult education centers, and nursing homes, offer free CNA classes, while others accept financial aid and payment plans. You can also apply for your employer to reimburse your training or supplement your certification with on-the-job training. The CNA state exam is distributed through Massachusetts Nurse Aide Competency Evaluation Program. To apply for certification call the state Nurse Aide Testing Office at (781) 979-4010, or at 1 (800) 962-4337. The Massachusetts American Red Cross also offers CNA training and certification, they also provide a multitude of information to help you succeed in the examination process, including a free CNA practice test, applications, and test site locations and times. The CNA test in Massachusetts is comprised of 2 portions: a written (or oral) exam, and a clinical skills evaluation. Both are administered on the same day. The written exam has 60 multiple choice questions in English and you will have 2 hours to complete it. If English is your second language, you are able to opt out and take the written exam orally. You can take CNA classes en español as well. The oral exam consists of 60 multiple-choice questions and 10 reading comprehension questions. The skills examination requires the nurse aide evaluator to supervise you performing 5 skills randomly selected from a list of 34 skills in 30 minutes or less. You must perform 4 of the 5 skills correctly to pass. You can schedule your examination with the Massachusetts Nurse Aide Testing Office at (781) 979-4010 or 1 (800) 962-4337. If you have a disability, you may request special arrangements for the test that must be approved in advance. If you don’t pass the exam on your first try, it is possible to retake the exam twice. If you fail the test three times, you must re-train at an approved program before attempting the test a fourth time. Once you pass the exam, Congratulations! Your certificate will arrive in the mail 4-6 weeks later. You can check on the status of your test results on the Office of Health and Humans Services Website. According to the U.S. Bureau of Labor Statistics Massachusetts currently employs 42,000 CNAs and is ranked top in the nation for CNA wages with Boston being the 5th top-paying metro area in the country at nearly $16/hour. The Boston metropolitan area, which makes up roughly 68% of the state workforce, is ranked as one of the country’s metropolitan areas with the highest employment rates, there are nearly 3 million jobs in the city. One of the nation’s top-paying nonmetropolitan areas for nursing assistant salary is Nantucket Island and Martha’s Vineyard, with an hourly wage of nearly $19/hour and a yearly salary of more than $38,000. 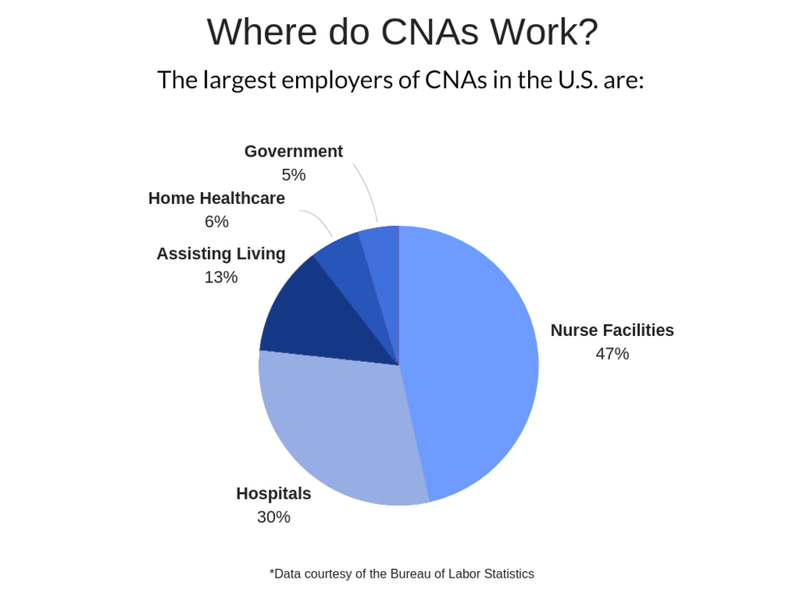 Nearly 50% of CNAs work in Nursing Care Facilities, and there are 500 registered nursing facilities in the state of Massachusetts that offer employment. An entry-level position in the medical field, CNAs are given many opportunities to reach that next level. 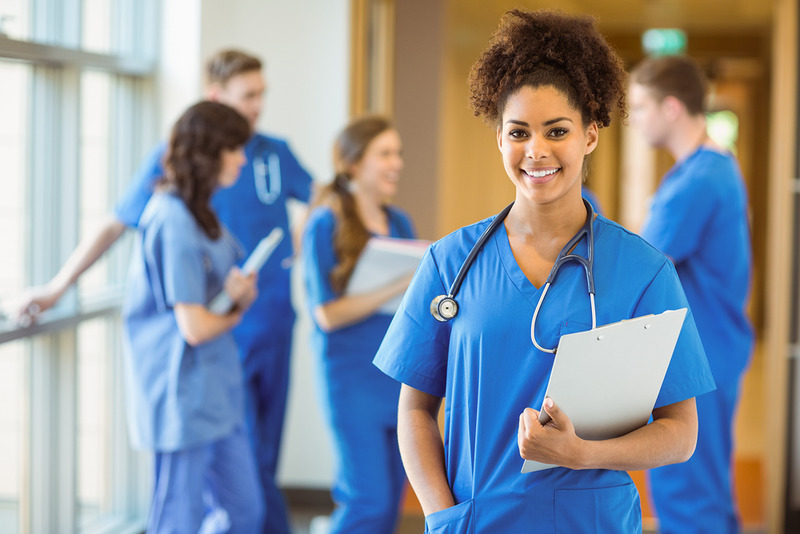 CNAs work with a Licensed Practical Nurse (LPN) and directly under a Registered Nurse (RN), so they are rewarded by seeing firsthand what it looks like to reach that next level. To become a LPN, a CNA can apply for a bridge course that can be found at a community college or a vocational training school that can either be offered online or on-campus. Typically this training includes a 6-24 week class with 75 hours of training, however many current CNAs are able to use their work hours to apply to training, making it very easy to promote. Massachusetts has such a turnaround in CNA jobs advancement, that thousands of CNA jobs will open annually because of it. You may also join an association for resources and to help advance your career, such as the Massachusetts Nurses Association. A month before your Registry listing expires the American Red Cross Testing Office will send you a reminder with instructions for obtaining a Registry Renewal. Your most recent employer must complete the form and send it back to the American Red Cross Testing Office. The state of Massachusetts requires you to renew a CNA license every 2 years. Within 2 years, you must complete 8 hours of in-service training and provide proof of qualifying employment in order to maintain an active status as you renew your CNA license in Massachusetts. The expiration date for your new CNA certificate will be determined by the date of the last hours of logged CNA work. 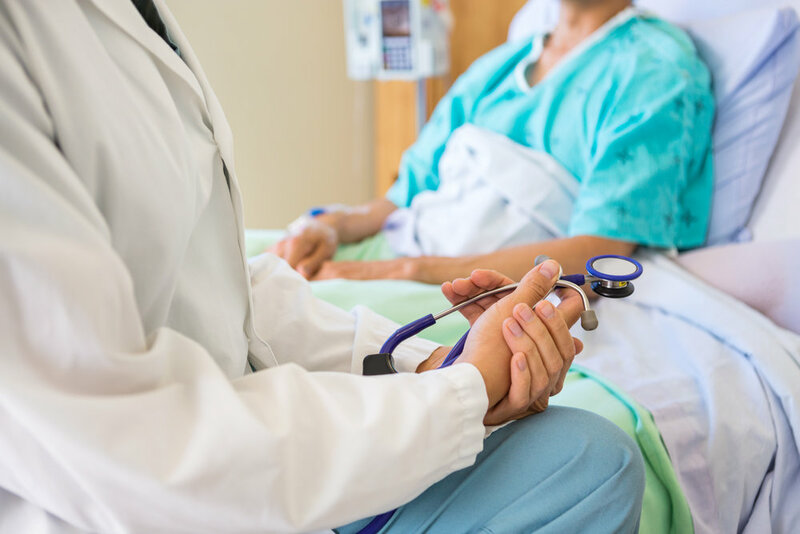 In order to check if your work hours meet the required criteria for Registry Renewal, see page 9 of the Massachusetts Nurse Aide Testing Candidate Guide Handbook. You must start the renewal process 3 months before your license expires. If you fail to complete renewal, your nurse aide license will expire and you will not be legally employable until it is active again. If you cannot verify employment, you will also have to re-train and re-test. If you are out-of-state and already a CNA, such as a military exemption, you can apply for reciprocity and CNA recertification in Massachusetts at . All nurse aides and nurse aide candidates must register in Massachusetts Division of Healthcare Facility Licensure and Certification Massachusetts Nurse Aide Registry. A registered CNA must graduate from an accredited program and have an active license. Healthcare Training Centers of America, Inc.
Mt Wachusett Community College Nursing Dept. N. Shore Com. College @ Hunt Nsg. & Rehab. Ctr. Spectrum Healthcare Training Center . Inc.